No U Turns. No Mercy. Fast, simple, destructive D6 dice pool play is easy teach, with loads of variation. PVP car combat for up to 8 players. Destroyed on the highway? Eliminated players become suicidal GHOST RIDERS, riding their explosive motorcycle the opposite direction of play. All the PRINT n PLAY assets you need are included. A full section on crafting your custom cars, board, and obstacles. 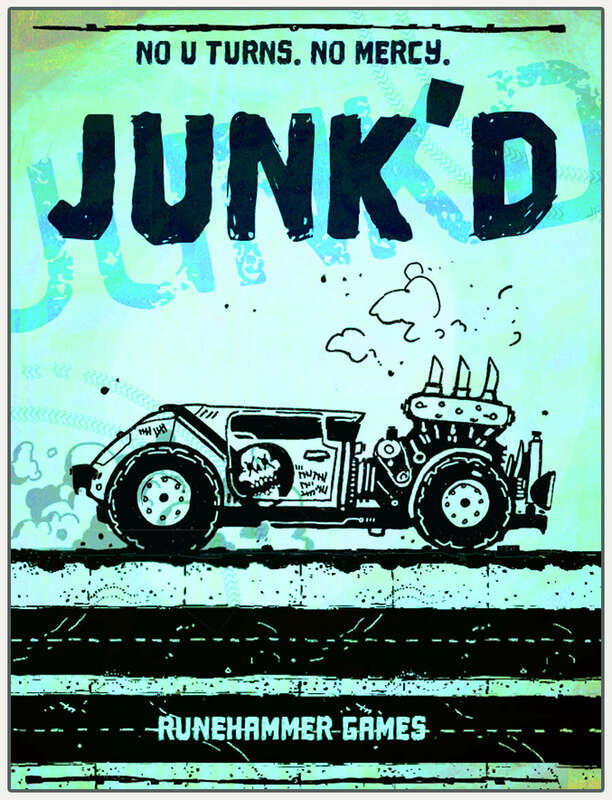 Put your heel to the steel, this is JUNK'D! Something is wrong. It wont let me print this file. My other files print fine. Can this be printed in Black & white? That grey background on every page will eat all my ink. Hey man, got a couple of questions mainly around more than one car in a lane segment. From the rules i'm inferring up to 2 cars can occupy the same lane segment. What happens if a 3rd tries to join ? From the side it would be treated as a ram, but what if they come up from behind ? They've already rolled engine to move, but would that also be treated as a ram in that one of the cars makes an armour save (call it a bonus ram for the slipstream effect ?). What if a car tries to move past a lane segment with 2 cars in it ? Again i'd guess treat it as a "bonus" ram, if successful they end their move in that space. If you shoot into a space occupied by 2 cars, do you hit both or pick a target ? When exiting a stretch, if there are 2 cars already exiting via the lane you are in what happens ? It's too late for a bonus ram, maybe you're forced to stop short and will have to change lanes and move to exit. I've also got a small change suggestion...See more - for most rolls your target number is a lane, but not for armour saves or to recover from being junk'd. If for those rolls your target number was your lane and not a 6, it would just streamline the rules a tiny bit. What determines if a roll is successful? Rolls are automatically successful if you roll the appropriate lane that your target is in. e.g If you try to ram another car in lane 4, and you roll a 4, you've hit! Don't forget the target always gets an Armor save. 1. What happens when you collide with a barrier? 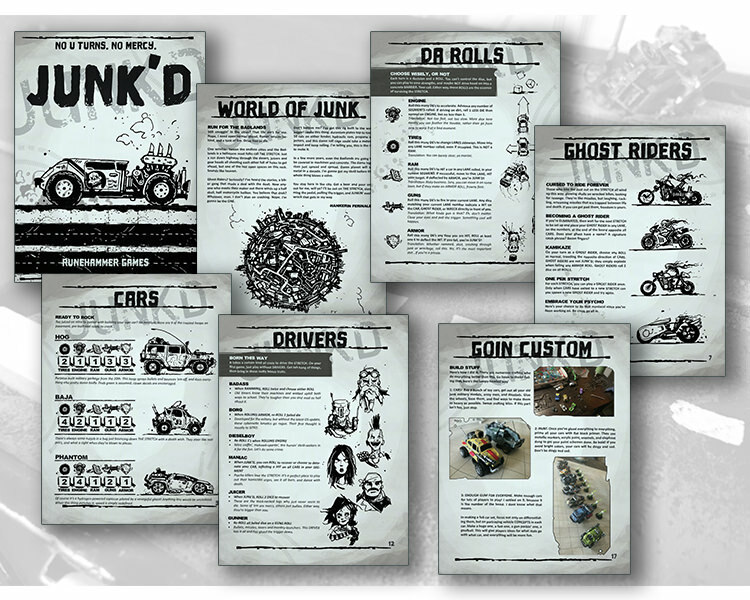 Do you get Junkd or do you immediately become a ghost rider? 2. What happens when you roll tires and all your rolled dice spots are filled up? Do you not get to move/roll the tire stat, or do you share that lane with whatever or whoever is there? 3. In the core mechanics, it says you roll 1-4 D6’s at once per that roll, does that mean that the max amount of dice you can have for one stat is four, or could you hypothetically have six dice for one stat? I love this game and I hope these are easy rules to clear up. Have the Barrier rules been updated? They seemed to be missing from the first uploaded version. This is a Brilliant game! It's fast paced, super easy to learn, and very easy to setup! You get right to the action in min, instead of having to spend 2 hours learning how to play like most new board games these days. My Wife and I have had an absolute blast playing it! When it comes to mega fun and elegant rules...it's a smooth ride! Charles B O. I. O. This title was added to our catalog on July 17, 2018.